The Enclave Of Naples Condos: Excellent opportunity to acquire a first floor 2 bedroom, 2 bathroom condo that has been remodeled. Offers stainless steel appliances, granite countertops, and tile floors throughout. This is a split bedroom floor plan with the living/dining room and kitchen area in the center and a bedroom and bathroom on each side of it. Close to the clubhouse, the community pool and spa, the billiards and exercise rooms. Offers an outdoor BBQ area with picnic benches and a beautiful lake. The air conditioning system was recently replaced. Complete with furnishings as shown. The Enclave Of Naples Condos: C.15487 - WHAT A TERRIFIC PRICE FOR ALL THAT YOU GET! Move right into this light and bright 2-bedroom 2-bath unit which has recently been painted, brand new carpet installed along with a brand new AC system that comes with a 10 year warranty. The open and airy kitchen joins the living room and dining area for a centralized gathering place. There is so much to offer at the Enclave which includes gated secure entry, clubhouse, fitness room, lighted tennis court, beautiful resort heated pool overlooking the lake, hot tub and spacious pool deck overlooking the lake, billiards room and community room and Wi-Fi area at the Clubhouse. Short drive to 5th Ave shopping, dining, art galleries, theater and the sugar sand beaches. The Enclave Of Naples Condos: Must see this beautiful double master suit first floor condo! Best priced condo in the Enclaves. The Enclaves in Naples has resort style amenities including a community pool and hot tub, fitness and billiards room, racquetball and tennis court. Also has a BBQ picnic area and nice clubhouse. Located just minutes from downtown Naples and the beaches. Call for a private showing. Hurry, this one won't last long! 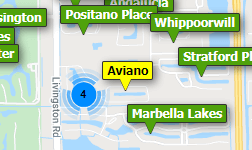 Need professional assistance selling your property at The Enclave Of Naples Naples? Find out how an Area Specialist can help to generate more property exposure in order to get the most money for your investment in the least amount of time.